There are some wine areas in the world that I always seem to forget. But luckily, they have a way of coming back to me, again and again. Such an area is Vouvray, an appellation of 2000 ha. in the middle of France, along the river Loire. 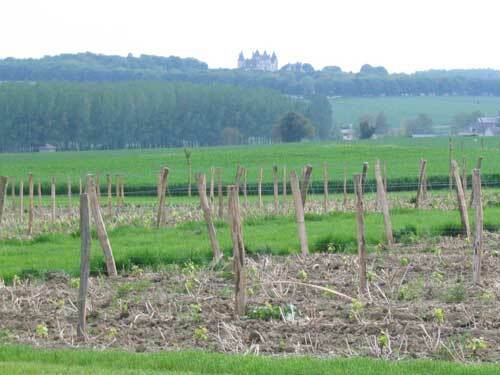 I visited the area several times with the family, and once on a wine trip with the Dutch Wijnacademy. And each time I fell in love with the wines again. The times that we visited with the family were always an absolute must on our trip: on our way to our campsite or rented house we would exit Autoroute A10 just before Tours, take route D952 along the river Loire and try to find La Vallée de la Coquette, where a friendly cooperative with tasting room is situated. On another trip, we also visited famous producer Domaine Huet. We would stock up on the wines, and the first bottles to be opened in front of our tent would invariably be a Chenin from Vouvray! Because that is what all the wines in de AOC Vouvray are made of: the white grape variety Chenin Blanc, named after a mountain, Mount Chenin, in the south of the area. But then, back home in The Netherlands, the remaining bottles would be emptied, sooner or later (later in the case of the bottles from Domaine Huet, since they can stand ageing very well) and Chenin would slowly be driven from our minds by other wines. Until the next holiday…. 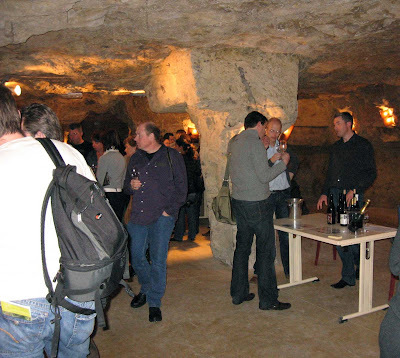 In 2008 I visited Vouvray for the last time, this time with a group of ‘vinologen’ in training; ‘vinoloog’ is the Dutch word for wine specialist. In April 2008, we arrived late afternoon, and left early in the morning, so unfortunately I could not visit the area and only had a quick glimpse of the vineyards and of the hamlets hidden in the folds of the landscape. On this trip, we were welcomed in one of the famous limestone caves by a group of very enthusiastic wine producers. We tasted their wines, took part in an excellent buffet and had a lot of fun. But after that trip, those delicious wines again were driven to the background. Luckily for me, the Vouvray producers are a very active lot. Each year, for four years in a row now, they visit Holland’s main wine fair, Wine Professional, and organise several interesting tastings. With the support of InterLoire and Dutch marketing organisation Alter Ego, they try to warm up our restaurants and retailers to the wonderful wines of the Chenin Blanc. At this fair, in 2010 I discovered the wines of Château Moncontour, and also took home some samples of other Vouvray wines bottled in small glass cilinders of 25 cl. A very clever way to promote the wines! This year (2011), in January, I attended a master class on the Vouvray wines, and was struck by the diversity of the Chenin grape: sparkling, dry, semi-sweet and sweet. I know of just one other grape with which a wine maker can achieve this: Riesling. And it is probably no coincidence that Chenin and Riesling are often compared! The first wine in this masterclass was a Vouvray Méthode Traditionelle Brut 2006 from Philippe Brisebarre. Monsieur Brisebarre himself introduced the wine, and told us about the vinification process. This Brut is allowed to stay on its lees for three years, which results in a fine complexity, with lots of yeasty impressions, aroma’s of citrus, minerals and some recognizable chenin-ness which I cannot adequately describe. Is it honey? Is it wild meadow flowers or honeysuckle? The next three wines where dry, with different amounts of residual sugar. 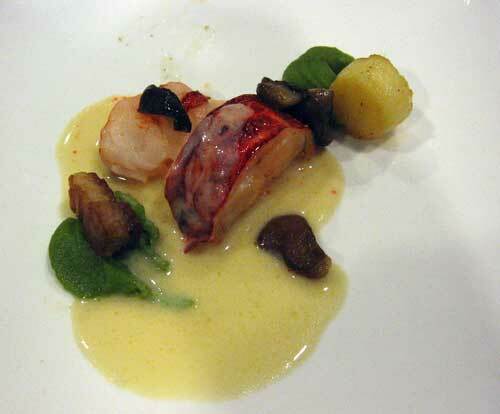 A rising Dutch chef, Niven Kunz, made two small dishes to accompany the wines. One was coquille saint jacques with red beet, another braised lobster. Especially the Château Gaudrelle Vouvray Sec Tendre Turonien 2009 was an excellent combination with the coquille. To finish the masterclass, two ‘moelleux’ (sweet) wines were presented, both from Château Gaudrelle. And what a treat they were. I simply love those sweet Chenins, for their excellent balance of sweet and sour, of residual sugar and acidity! The grapes for the Reserve Spéciale 2009 were harvested only 10 days before the grapes for the Réserve Personelle 2009, but what difference: 85 grams of residual sugar per liter in the Spéciale, 190 grams/liter in the Personelle. Both ‘moelleux’ were very different to taste and to enjoy. The Spéciale, with 85 grams/liter, was a good combination with the lobster, the Personelle was not. This last one I would like to try with apple or almond pie, with patés of duck or goose or as an apéritif. And so, in one masterclass, we had all the different Vouvray styles before us, and once again I was reminded of the wonderful wines of this small town and appellation in France. When are we going to visit again…?